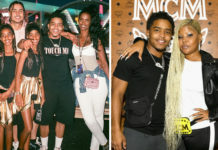 Diddy is pissed that those pics of his sweet thang Cassie leaked to the internet so he’s gone on a rampage and is attacking anyone and everyone who gives him the wrong look! … Just kidding! 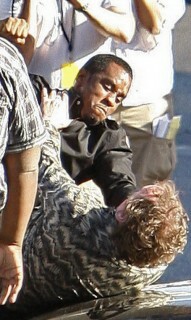 Diddy was spotted filming scenes for his new movie Get Him to the Greek this past Tuesday in Vegas. The upcoming comedy is a flick about a record company intern (played by Jonah Hill) who is hired to accompany an out-of-control British rock star named Aldous Snow, played by Russell Brand, to a concert at LA’s Greek Theater. The “Forgetting Sarah Marshall” spin-off, directed by Nicholas Stoller, will also feature a few cameo appearances from Pink, Katy Perry, Christina Milian and others. Sounds interesting! 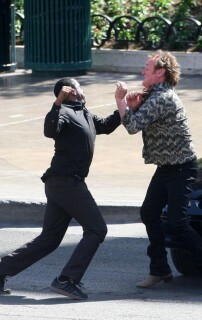 More pics of Diddy getting rough with Colm Meany when you continue reading.